Danish sleaze rockers, Junkyard Drive, have just unleashed a new video for their song “Drama Queen” from their upcoming album Sin & Tonic, which will be released in early 2017. 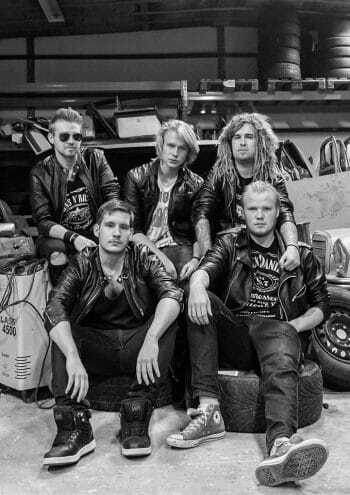 “Junkyard Drive is an upcoming band from Denmark, formed in the spring of 2014. Junkyard Drive was made because the five young rockers thought that this generation needed some real Rock N’ Roll. Junkyard Drive consist of Kris on lead vocals, Birk on lead guitar and backup vocals, Benjamin on rhythm guitar and backup vocals, Mikkel on bass, and Claus on drums and cowbell. “Drama Queen” is taken from the Junkyard Drive album to be released in early 2017 on Mighty Music/Target Group. https://www.facebook.com/junkyarddriveofficial Directed, filmed & edited by William Findinge. Video produced by Phillipa Records(c) Starring: Cecilie Caroline Häggqvist. Thanks to: El Loco bar, Aarhus Vinstuen, Aarhus Escobar, Aarhus Peter Gift, Aarhus Sebastian Felis.